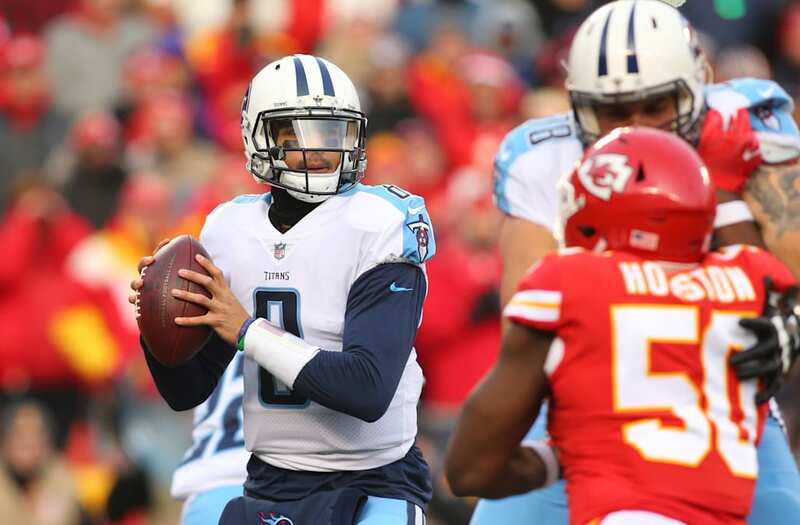 Marcus Mariota threw a touchdown to himself in the Tennessee Titans Wild Card game against the Kansas City Chiefs. The play caused a bit of confusion on the field, but was eventually upheld and will surely go down as one of the wildest plays of the NFL postseason. Mariota's miracle play made for a confusing box score update, which listed the Titans quarterback for both a passing and receiving touchdown on the same play. Marcus Mariota threw himself a touchdown pass, making what will surely be the wildest play of this Wild Card weekend. The play came in the third quarter of Saturday's game between the Tennessee Titans and Kansas City Chiefs. With the Titans down 21-3 and needing a score facing third-and-goal, Marcus Mariota dropped backed and looked for an open receiver in the end zone. After scrambling in and out of the pocket, Mariota eventually made a throw that was deflected into the air by Darrelle Revis, but Mariota was quick to find the loose ball, catch it, and dive into the end zone to score the Titans first touchdown of the game. It's one of the craziest plays that you will ever see, and you can watch it below. After the score the play was automatically reviewed, and some were concerned that Mariota had crossed the line of scrimmage before releasing the ball, therefore nullifying the stunning play. But the play was upheld on review and the Titans cut the Chiefs' lead to 21-10. The play makes for what would surely read as a confusing box score in the days before video could instantly be viewed on a smart phone, as Mariota is currently credited with a passing touchdown and receiving touchdown for the same play. Somewhere, a fantasy football player is howling in delight.